When I’m searching for an answer to a question – big or small – I often head over to Google. If the first search term I type in doesn’t send me in the direction I was hoping, I head back to the top of the screen and try typing in something different. Now we often do this without thinking; it’s become a natural way we navigate online spaces. But these simple steps involve a set of problem-solving and vocabulary skills that students need in order to successfully navigate the digital world. Vocabulary instruction is sometimes an isolated event in classrooms. As an elementary school teacher, I definitely introduced word lists and spelling tests with vocabulary unrelated to the topics we explored in different parts of the school day. These activities weren’t particularly authentic or relevant to my students. But there are lots of ways to leverage “real” moments through the school day to help students discover new vocabulary and put their English Language Arts skills into action. I’m a huge fan of Adobe Spark and if you’ve visited my blog before that’s no surprise. You might have grabbed my free Spark graphic organizers or picked up a copy of my book, co-written with Ben Forta, 40 Ways to Inject Creativity into Your Classroom with Adobe Spark. When it comes to exploring new vocabulary with your students, Spark is a perfect place to put your subject matter into action. Spark Post, Page, and Video all include options to search for images and icons right from within the tool. Having access to this feature means your students don’t have to worry about uploading pictures from other places. Unless of course, they want to add a picture they’ve snapped themselves. In the screenshots in this blog post, you can see the search features in each of the three Spark tools. Users can look for pictures from Unsplash and Pixaby all tagged for reuse in your project. In Page and Video, the credits for the images you choose will automatically appear at the bottom of the Page or the last slide of your Video. Spark Post and Video also let users search for icons from the Noun Project to add to their creation. 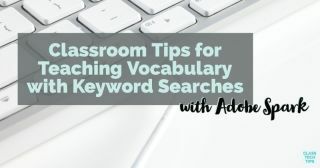 A keyword search requires students to pause and think about the perfect word to use as a search term. If students are looking for something very broad or very specific, it can be challenging to find the perfect image or icon. As students create a Page, Post or Video they can brainstorm the type of pictures and icons they will need. Then they can develop a list of potential search terms. This exercise can happen as a pre-publishing activity before they even jump into the tool. Imagine your students are publishing a Post, Video or Page after researching facts about Toucans. They can develop a list of keyword search terms that relate to the subtopics they will include in their final product. So in addition to preparing a paragraph for a Spark Page, or a script to read for the narration of a Spark Video slide, they can pull out the keywords that compliment each subtopic. If the big topic for a student project is Toucans, the subtopics might include (1) habitat, (2) diet, (3) geography, or (4) threats. The subtopics of a student research activity may align with a checklist or rubric you have shared with them. Or it might include areas that students have identified themselves after conducting preliminary research on a topic. What type of picture do I want to include in this section? Ex. When talking about geography, I want to use images of South America and the rainforest. In addition to posing questions to students, you might introduce a mind map activity. This can help students connect words that relate to one another. It’s also an opportunity for you to share a thesaurus tool with students. This can help students explore relationships between words. You can tailor this activity your goals around domain-specific vocabulary words and ELA instruction. Learn more about Spark for Education by heading over to this page from Adobe. Although your older students can jump in right away, this post includes directions for getting full premium features for free and setting up accounts for students under 13. Freebie: Find a graphic organizer for this activity in this bundle of freebies! Ready for more: Here’s a link to the book 40 Ways to Inject Creativity into Your Classroom with Adobe Spark.